They’re off! For only the second time in its 43 year history the official restart of the Iditarod had to be moved from Willow to Fairbanks because of snow conditions, or lack thereof! After a ceremonial start last Saturday in Anchorage (where snow had to be trucked in) 79 teams left today from Fairbanks to race 1,000 miles to Nome, including teams from Norway, Sweden, New Zealand, Australia, France and Canada. 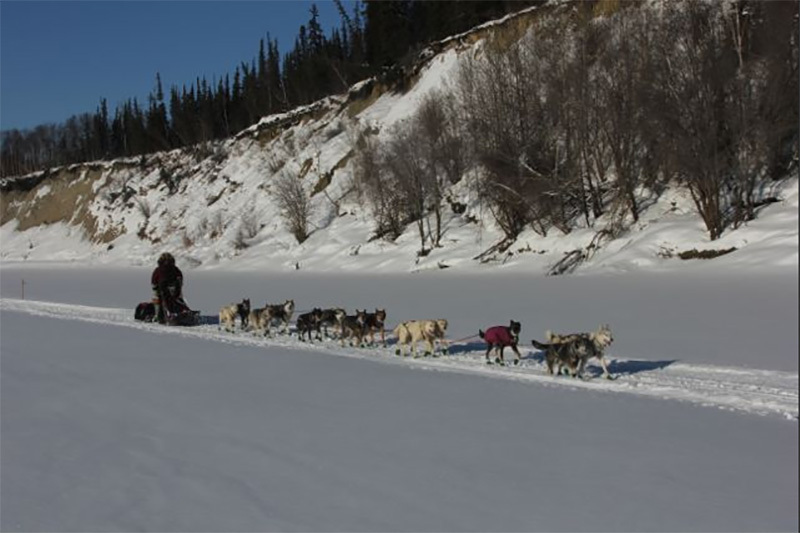 The mushers and dogs traveled 71 miles to the first checkpoint of Nenaha and then another 90 miles to the second checkpoint of Manley Hot Springs; the earliest ones arriving there around 3:00 a.m. They are each checked in with their time and sign the form. If they’re taking a rest there it’s a busy time with the musher putting down straw for the dogs, taking off the 4 booties on all of the 16 dogs (64), feeding, watering, etc. as a vet does their rounds to check each of the canine athletes. Then the mushers dry their clothes and boots, eat and rest before readying to go out again. Many checkpoint towns give them a warm welcome and provide meals for the human athletes while their teams rest. The dogs are pulling so much at the starts that they and the sleds have to be physically held back by multiple handlers. They are excited to get on the trail and run barking, yipping and howling, jumping in their leads, with tails wagging and what look like smiles — they know what’s coming! 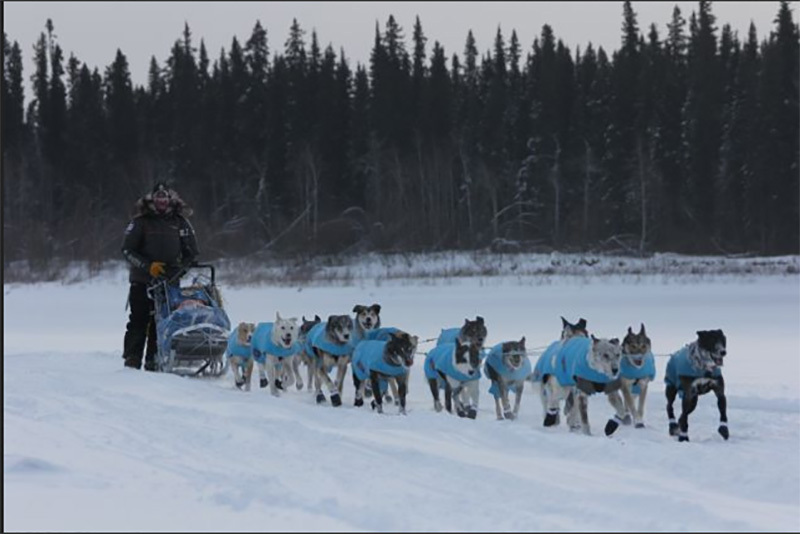 The third day of the Iditarod continues after runs down the frozen Yukon river from Tanana to Ruby which is 346 miles from the start at Fairbanks. Teams experienced 40 below last night on the river. A father and son are competing again this year: Mitch Seavey and his son Dallas Seavey’s teams arrived first and second into the checkpoint at Ruby. 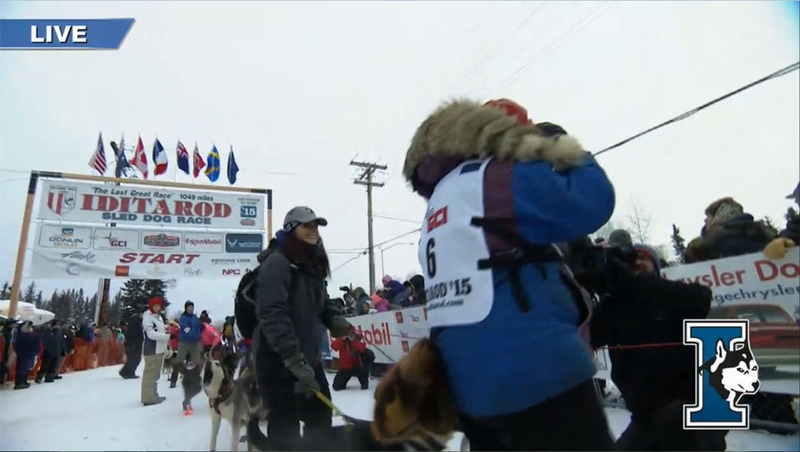 They have each won the Iditarod twice: Mitch in 2004 and 2013 and Dallas in 2012 and 2014. Four-time Iditarod race champion Lance Mackey is having circulation problems in his swollen hands and will try to continue to Nome, but let his hands get too cold and is having extreme difficulty. He has said this will be his last Iditarod race. Mushers wear liner gloves inside heated gloves which are inside seal fur mittens! Unfortunately, the racer currently in fifth place, Brent Sass, was disqualified for using a two-way communication device. Rule 35 prohibits their use; many mushers use iPods for music along the long trail, but Brent had unthinkingly brought his iPod Touch. He had no intention of using the wifi at checkpoints or contacting anyone (and gave his dad his cell phone to keep) but had to acknowledge he had mistakenly brought the two-way device. Picture below is of dog teams in their brightly colored coats and booties resting at a checkpoint in Tanana. Day four of the race finds the leading teams heading into Huslia, 478 miles from Fairbanks and considered the 1/2 way point. Aaron Burmeister’s team is currently in the lead and is expected to receive the Half Way Award at this northernmost point on the Iditarod Trail. Teams are required to take two rest stops; an 8 hour rest (which two-thirds of the racers have already completed) and a 24-hour rest, which many teams are expected to take in Huslia. Three teams have dropped out of the race. More teams have now arrived in Huslia and many are taking their 24 hour mandatory rest period there. Some teams have had to ‘drop’ dogs for various reasons like sore legs or shoulders. The dogs are flown back to Anchorage and cared for there at the Millennium Hotel by volunteers until handlers can come pick them up and return them home or to kennels to await their musher. Some teams are down to 14 dogs now; they start with more to allow for drops. Temperatures have been in the minus 40s, but teams are thankful there hasn’t been wind. They’ve also enjoyed seeing the aurora borealis the last 3 nights. 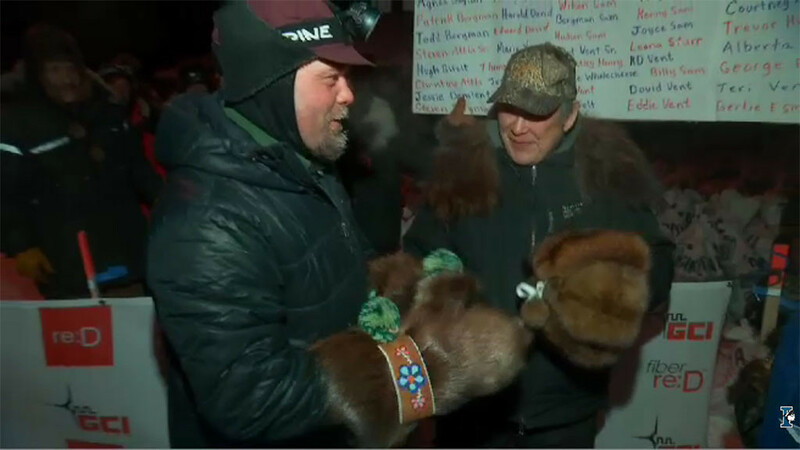 The first musher into Huslia, Aaron Burmeister, received the Half Way award which included beaver fur mitts beautifully trimmed with beads, a fur hat and ruff made by local Native Alaskans, as well as $3500 in gold nuggets from GCI, a sponsor of the Iditarod. The First to the Yukon award in Galena, Jeff King, also won beautiful gloves, a big steak dinner and $3500 cash from the Millenium Hotel, a race sponsor. Jeff asked Native Alaskan Paddy Nollner to join him for his five course meal. Paddy is the son of Edgar Nollner, one of the historical mushers who helped carry the all-important smallpox serum to Nome during a severe outbreak back in 1928.